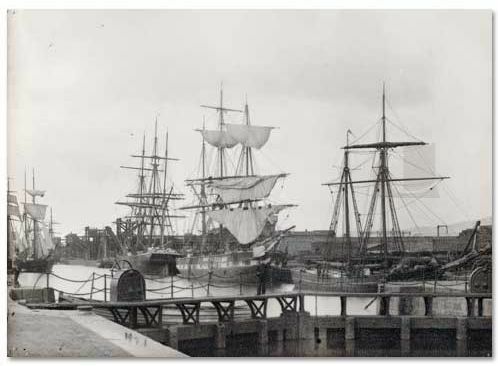 Copper barques and Cape Horners battled regularly through tempestuous seas to bring back ore to Swansea from around the world. In their way they were as important as the industrialists were when it came to Swansea’s development as a world-class centre of metallurgy. Just as the men of importance were recorded for posterity by the great portrait painters of the day, so the ships were recorded by a small group of highly skilled marine artists including James Harris Senior, James Harris Junior and Edward Duncan. Specialist artists, like W.H.Yorke of Liverpool, produced the detailed and highly stylised ship portraits much prized by owners and masters. 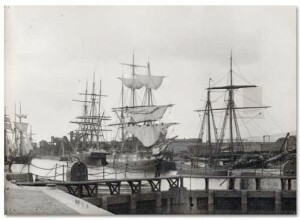 But Harris and co. captured the rigours of life at sea while the Reverend Calvert Richard Jones, a pioneer photographer, used the newly developed calotype process to record the ships and their crews in and around Swansea Harbour.